For the first time, Machine Learning and Artificial Intelligence (AI) have been used to design a consumer product. 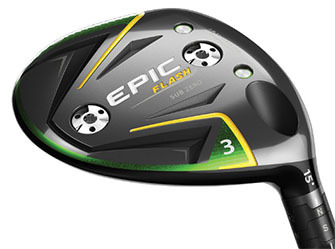 The result is the Epic Flash and Epic Flash Sub Zero line of drivers and fairway woods, which promise the best combination of speed and forgiveness yet from Callaway. While using a $5 million supercomputer to design golf clubs might seem a little extreme, the benefits of such advanced technology are even more so. Computer learning allows the knowledge of club-making to be expanded so much faster than the typical human trial-and-error feedback loop. “Human beliefs about what works would have constrained us from coming up with this design,” says Callaway SVP of Research and Development Alan “Doc Hock” Hocknell. Callaway took what they learned from using AI and applied it to their new Epic Flash and Epic Flash Sub Zero fairway woods. They came up with an ultra-thin, forged Carpenter 455 steel clubface that is expressly engineered for high coefficient of restitution (COR), which is a scientific term for how much energy can be transferred from one object to another. Simply put, the higher the COR, the higher the energy transfer from clubface to ball, and because the COR is high across a large area of the clubface, both the Epic Flash and Epic Flash Sub Zero promote fast ball speed on both center and off-center hits. Callaway engineers used Machine Learning – an application of Artificial Intelligence – to create a unique and radically different face design to increase ball speed in the center region of the face. Callaway continues to refine its Jailbreak Technology, which positions two ultra-light, strong titanium bars behind the face, parallel to each other and connected on either end to the crown and sole. These bars stiffen and stabilize the crown and sole, placing more impact load on the face to promote faster ball speed. In the Epic Flash fairway wood, the Forged 455 Carpenter steel construction combines with Face Cup technology to deliver fast ball speed across the face for distance on both center and off-center hits. In the Epic Flash Sub Zero fairway wood, two weight positions (16g and 2g) can be switched between front and back to adjust launch, spin and trajectory. Callaway designed an entirely new hosel system that’s shorter and lighter than before; since it is lighter, the weight it saves can be redistributed elsewhere within the head to reposition the center of gravity for easy launch and high, long-carrying flight. In the Sub Zero, the new hosel offers adjustability to a wide range of lofts and lies, making it easier for a golfer to dial up a higher launch and different ball flights. For the Sub Zero, golfers can choose from one of two stock shaft options: Project X HZRDUS Smoke and Mitsubishi Tensei AV. For the Epic Flash, there is a third option: Project X EvenFlow. The Stock grip in both drivers is Golf Pride’s premium Tour Velvet ALIGN Grip (the #1 grip model on the PGA Tour) with a special green reminder ridge unique to the Epic Flash. The Epic Flash and Epic Flash Sub Zero drivers will be available to the public on February 1, 2019. Each will retail at a price of $299.99.